If you could finish your basement once-- and have it stay warm, beautiful, and healthy for the rest of your life, why wouldn't you? With the Total Basement Finishing System, you will have that lifelong security. Our products include a 50-year basement wall warranty, a 30-year ceiling tile warranty, and a wide variety of waterproof floorings. Choosing Total Basement Finishing is the way to finish your basement for life. Silver River Basement Systems is your locally owned and operated Total Basement Finishing contractor in the Colorado & New Mexico area. 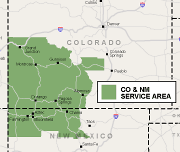 In operation since 2001, we proudly serve Grand Junction, Montrose, Gunnison, Alamosa, Durango & Pagosa Springs, CO and Farmington, Bloomfield, Aztec, Chama, NM. 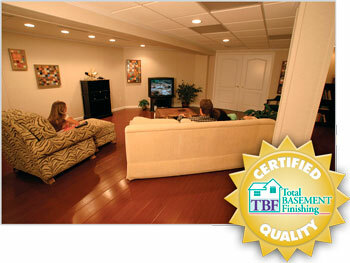 Our Total Basement Finishing System is a complete basement renovation package. This means that you can count on us as your one-stop remodeling source. This includes the floors, walls, windows, ceiling, electrical, lighting-- anything you need! Additionally, because our basement finishing system is so versatile, it allows for you to do virtually anything you want with your basement. Add an extra bedroom and living space, or mount a TV on our studless basement walls and design an entertainment room! If that's not what you're looking for, you can create a home office, basement bar, children's play area, home gym, music recording studio... anything you can imagine is possible through Silver River Basement Systems and Total Basement Finishing! If you're interested in planning and pricing for your remodeling project, Silver River Basement Systems can help you out. We would like to offer you a free basement design quote at no obligation. A design consultation with Total Basement Vision- our interactive software program. Your basement finishing proposal-- in writing and e-mailed to you or printed right away. Our full-color 88-page book: "Basement Finishing Science". At Silver River Basement Systems, our mission is to provide you with responsible basement finishing, at a fair price, while providing the most superior customer service in the contractor industry. Call or e-mail us today for your free basement finishing quote! We'll help you bring YOUR space from Basement to Beautiful in no time at all! I highly recommend Silver River because of their high-quality work.